We started our study of the Lewis and Clark Expedition in 2005, towards the beginning of the 200 year anniversary of their exciting adventure. From those studies, I created a Lewis and Clark Topical Study (which includes the Lewis and Clark Lapbook, A Brief Introduction to the Lewis and Clark Expedition, and my second novel, York Proceeded On. 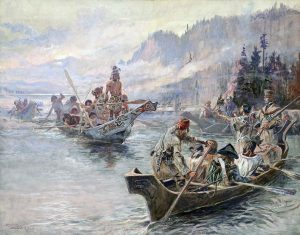 After studying the Lewis and Clark Expedition, my family had the opportunity for our own Lewis and Clark Adventures when our family planned a reunion in Montana. We spent about three weeks following the Lewis and Clark Trail to the Pacific and back. From those travels, I wrote a book, of our journey, the Lewis and Clark Expedition Jaime-Style.